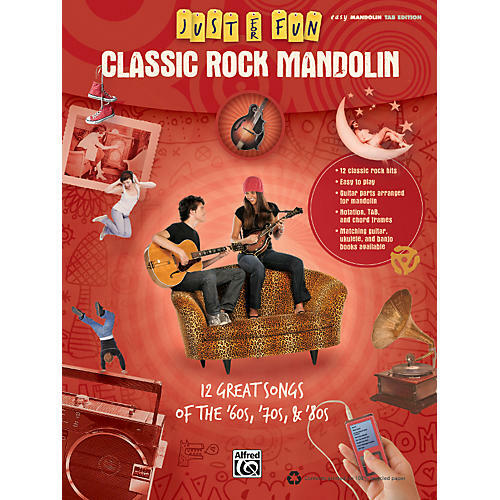 Just For Fun: Classic Rock Mandolin is designed for your total enjoyment. Each song uses the original guitar parts arranged for the mandolin. Titles: "After Midnight" (Eric Clapton) • "Go Your Own Way" (Fleetwood Mac) • "Hotel California" (Eagles) • "It's All Over Now" (The Rolling Stones) • "Jump" (Van Halen) • "Long Train Runnin'" (The Doobie Brothers) • "Maggie May" (Rod Stewart) • "The Night They Drove Old Dixie Down" (The Band) • "Paint It, Black" (The Rolling Stones) • "Stairway to Heaven" (Led Zeppelin) • "Sunshine of Your Love" (Cream) • "Truckin'" (Grateful Dead).